I just thought I would share with you some of our experience with KCLV and some ideas of how to improve it. 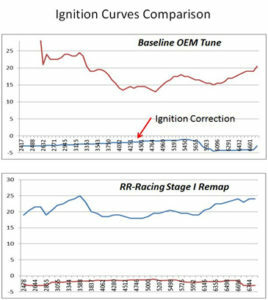 For those of you who haven’t heard of it, KCLV stands for “Knock Correction Learn Value.” It is simply a long term ignition correction factor. After you flash your car or reset your ECU, the KCLV goes to 15. 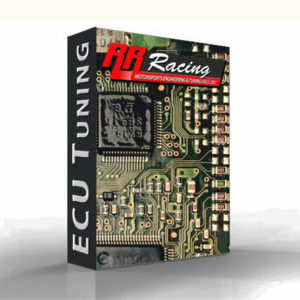 Once you start driving the car, particularly doing long pulls at high load, the ECU starts bumping the KCLV up in small incremental steps until some knock is detected. We have tuned quite a number of ISFs, and generally find them to be very consistent in their response to tuning, but occasionally, there are what I call “KCLV challenged” cars that tend to run lower KCLV with the tune, and without the tune, even those running 93 octane. 20+. We are fairly certain the car was run very easy, probably with a lot of city driving, and maybe even on 87 octane for a while. Pulling the plugs and inspecting the pistons showed a bit of excessive carbon buildup. (2) 1 bottle of Sea Foam intake treatment (and created lots of big smoke clouds). I recommend spraying it all in on a warm engine, then letting it soak for 15min or so. After running through the tank of gas this way, KCLV would immediately shoot to 22! Initially I thought that the bottle of injector treatment improved the fuel quality, but even on successive fill-ups, the KCLV shoots right back up after reset. So the bottom line is that if you have a higher mileage car, or the background of your car is unknown, this procedure is probably a good thing to do. I was even surprised with the results. 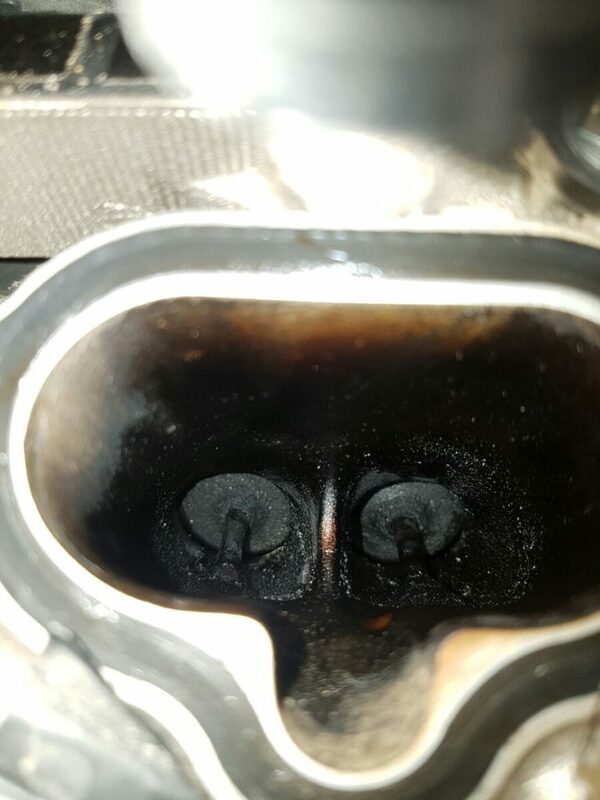 We haven’t tried it on an ISF yet, but I don’t see why it wouldn’t be effective, as carbon buildup affects most engines similarly (see the photo below of an ISF engine with heavy carbon buildup), and causes increased knock correction. I would recommend doing the Sea Foam treatment before changing oil, as some of the solvent may make its way to the oil. Our brake kits are engineered from the best-in-class components, carefully designed, selected, and/or manufactured by us right here in the United States to the highest quality standards. 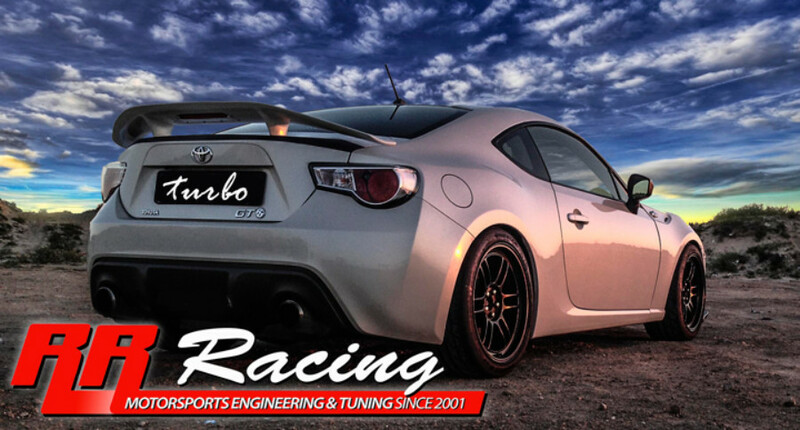 Our goal is to meet and exceed all quality, performance, aesthetic characteristics of top brands such as Brembo and AP Racing at an affordable price. All of our braking systems are track tested in very demanding conditions (please refer to our News page for latest track testing articles). The central part of our competition big brake kit systems is our high end competition two piece floating rotor. We start with discs from Coleman Racing, utilizing the same exact materials, metallurgy, and design as featured on top NASCAR Winston Cup and professional road racing. These extra heavy duty high carbon steel discs have directionally curved cooling vanes which actively pump air to cool the rotor. These discs combine unparalleled strength and durability to satisfy the most demanding competition requirements for both street and track use. We then zinc chromate plate the discs for superior corrosion resistance and durability. We offer both slotted and drilled patterns. Coleman Racing discs are balanced to high tolerance, which reduces feedback associated with rotor vibration and provides a smooth confident application of braking force. The two piece floating design is used in the most advanced applications to accommodate for thermal expansion under the most demanding track conditions. The two piece design also allows reducing the weight of the rotor by utilizing billet grade aluminum alloy for the hat. The following diagram illustrates our two-piece floating design. The hats are made by us in United States with US sourced material to the most demanding quality specifications. High strength billet aluminum is utilized for both strength and lightness. We hard anodize our hats to increase hardness and corrosion resistance. 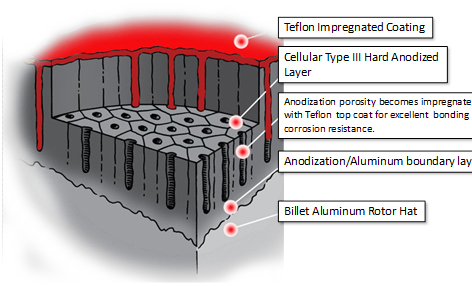 In addition to the hard anodized surface treatment, we take it a step further with Teflon Impregnation for superior aesthetic and durability as shown in the diagram below. High grade 10-12.9 mounting hardware is used. 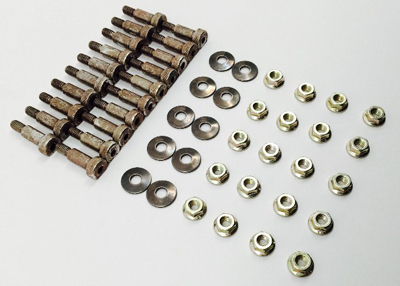 Our bobbin fasteners are Cadmium plated for superior corrosion resistance. 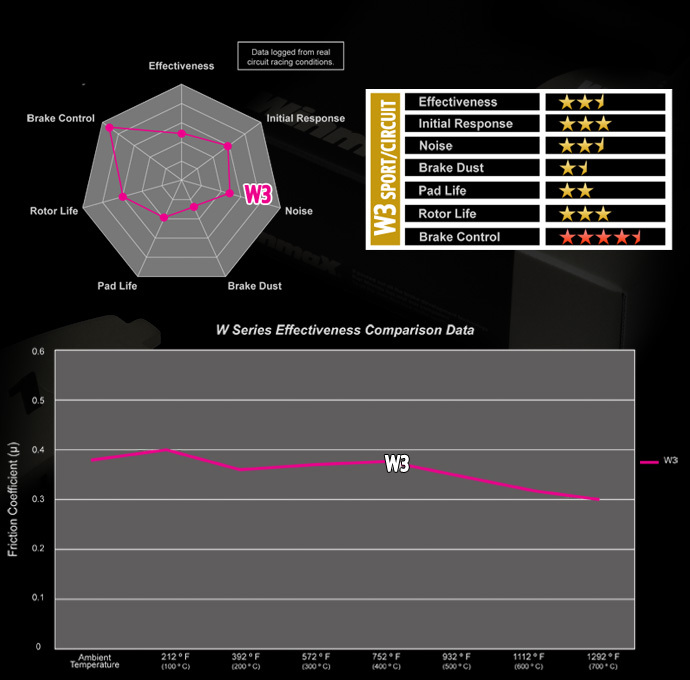 After testing a variety of calipers for our high end brake kits, we concluded that Wilwood calipers offer the best performance at a great value. 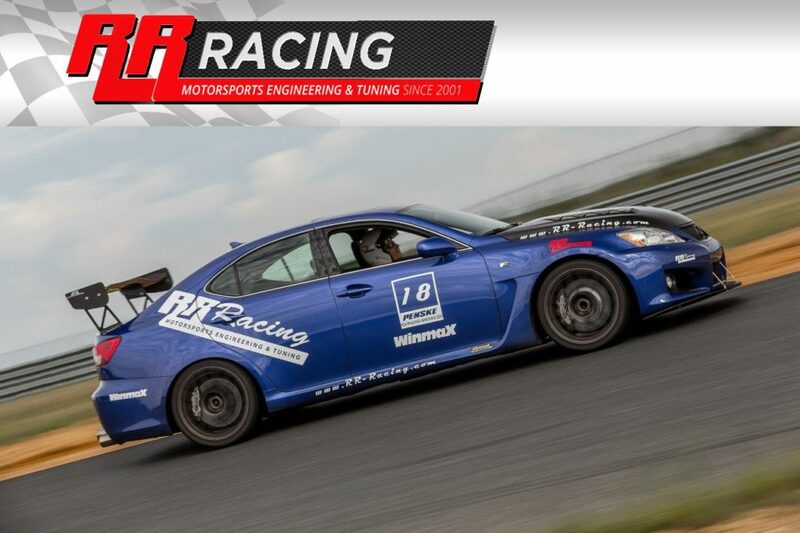 RR Racing Wilwood calipers were carefully selected and extensively tested with our braking systems. 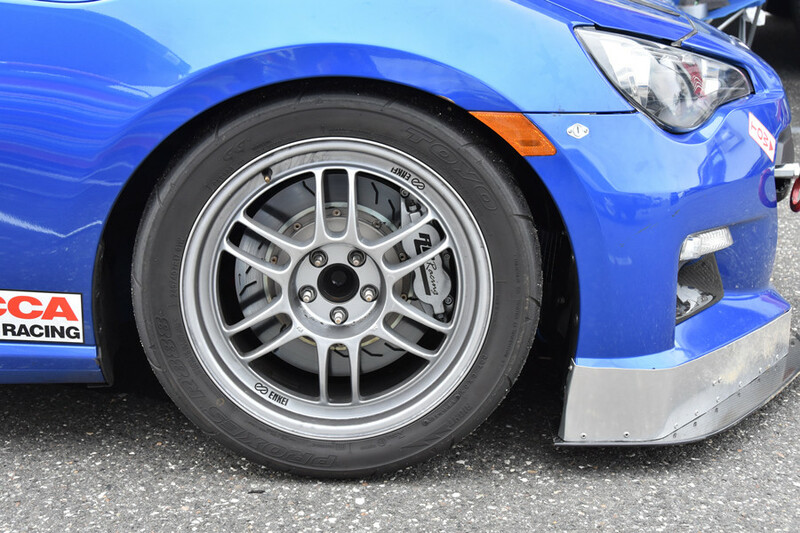 We utilize several four and six piston calipers with varying sizes ranging from FNSL6R in our Stage I kit and FSL6R in our high end and Competition kits. We also use Aero6 for our large disc Competition kits (e.g., ISX competition brake kit). The Wilwood Forged Superlight 6R series is the benchmark in street and track applications. 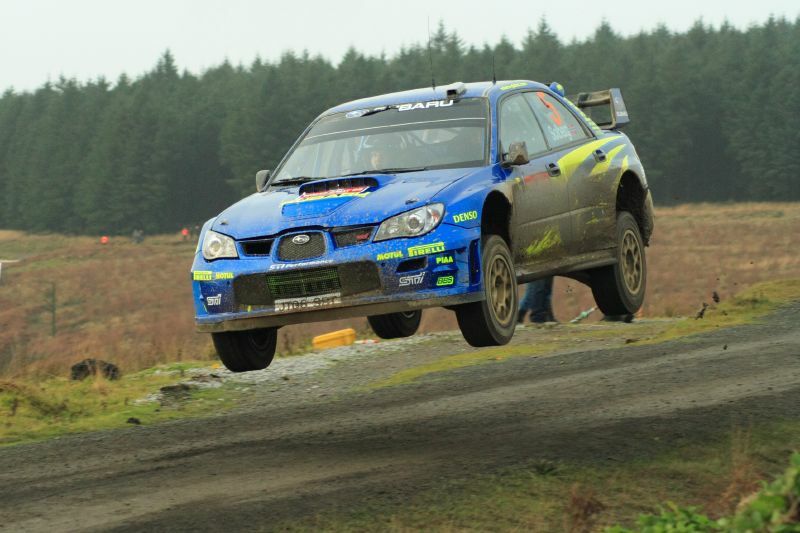 It also enjoys prominence in a variety of road-race, rally and sport driving. The new FSL6R model series is the latest innovation to this Superlite family of calipers. It has been redesigned with internal fluid ports that eliminate the external fluid cross-over tubes. The transfer tube has been replaced with two additional bleed screw assemblies which allow differential bore models to have a left hand and right hand orientation, but no leading or trailing configuration is required. The Forged Narrow Superlite 6R (FNSL6R) is Wilwood’s newest version for the venerable Superlite caliper series adds the versatility and convenience of radial mounting to this widely popular caliper group. Radial mounting simplifies adaptation and provides two planes of adjustment for accurate alignment over the disc. 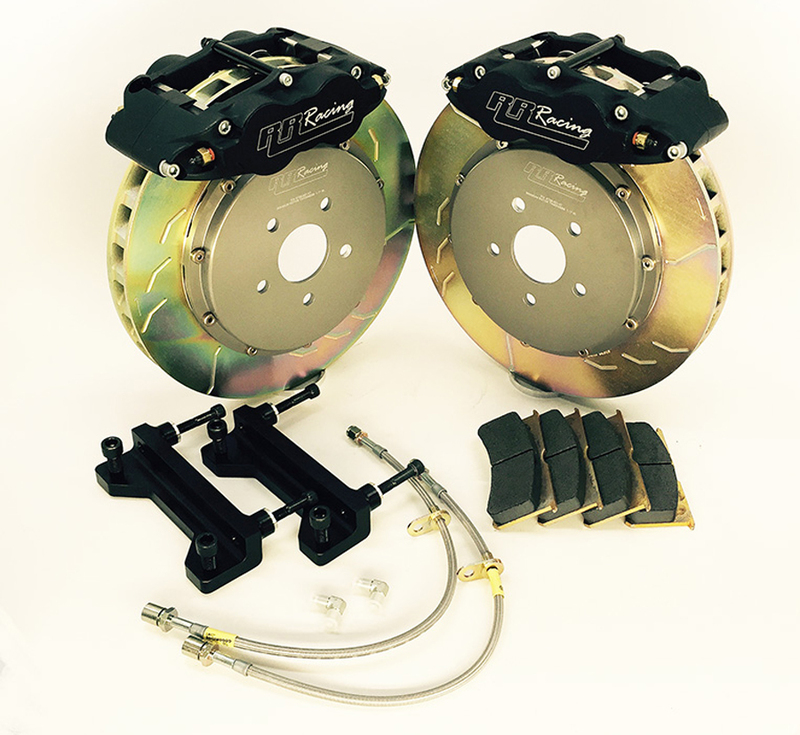 These calipers integrate “Big Brake” style with Wilwood’s latest technology to generate big stopping power in extreme environments over a broad range of vehicle applications. 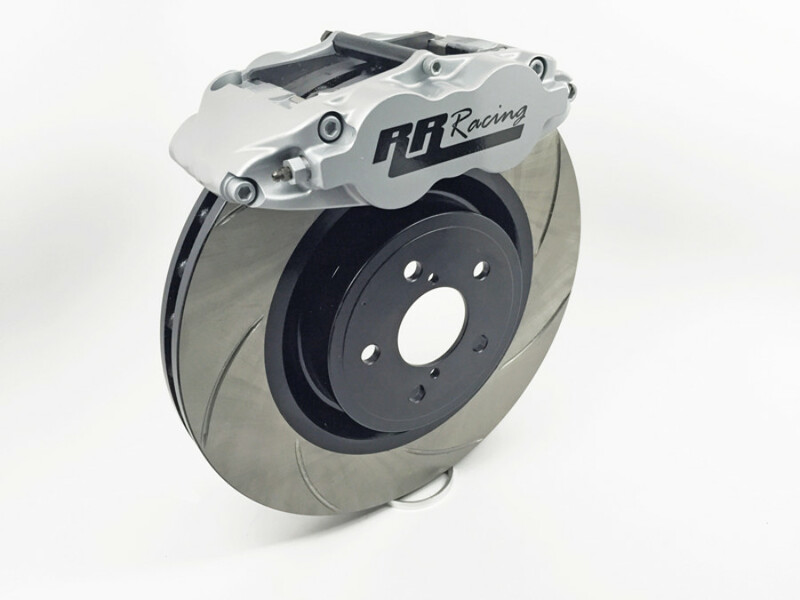 The new Aero6 forged six piston caliper delivers heavy duty stopping power for the road or track. The caliper incorporates race technology into a body design with widespread adaptability. Radial mounting, multiple options for piston volume, and large rotor diameter (we use it in our 14 inch kits) give this caliper the versatility necessary to suit all types of heavy weight braking requirements. In most of our kits we offer Wilwood calipers in black or red powder coated colors. Wilwood calipers offer both superior performance and great aesthetic looks. Our competition kits feature black anodized calipers to withstand the extreme temperature conditions associated with track use. Update September 2015: We now offer the calipers on variety of standard colors and any custom colors that could be selected from www.g2usa.com. Calipers are painted using a two component high temperature paint. We found this paint very durable even after repeated track uses (although we recommend the anodized version for heavy track/racing applications). 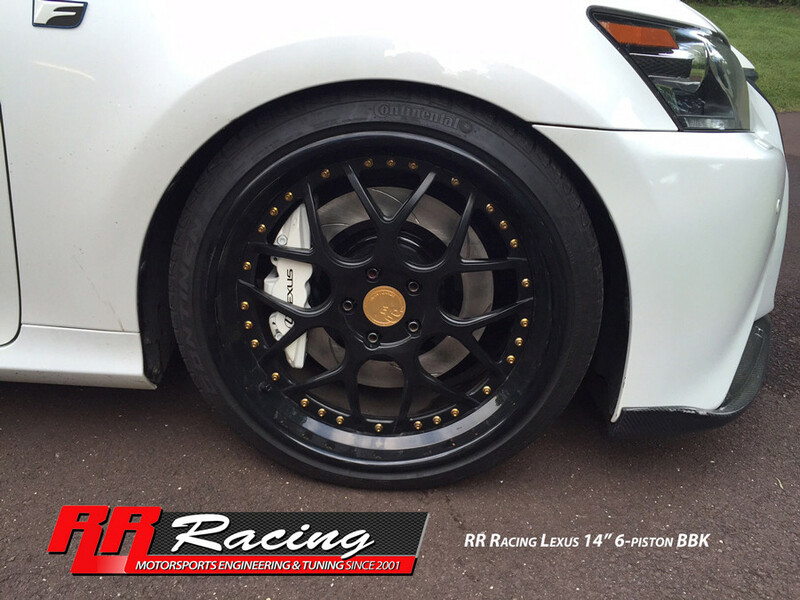 Painted calipers get a great looking RR Racing logo, or our customers can specify no logo for applying their favorite car logo (as shown on the GS350 application photo below). Offering custom calipers colors is a unique feature in the market today, and we feel it provides an important service to our customers looking for a unique look. 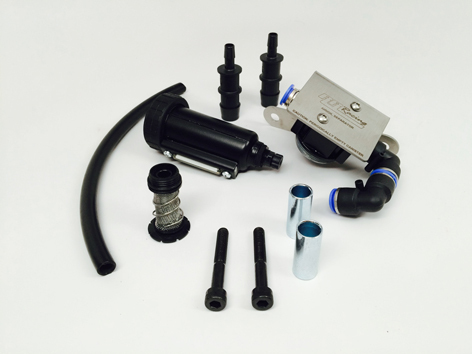 We engineer our brake systems for best quality, variety of flexible options at a great price! We offer Wilwoods BP10 through BP30 pads as well as Hawk HP-Plus pads as an option for some of our high-end braking systems. Temperature range and overall friction value are the primary considerations for pad selection. The pads must be capable of maintaining the proper amount of friction for stopping power within the temperatures that will be realized during demanding road applications or on the track. Then, overall wear rate must be considered. For most asphalt and road race applications, compounds in the high temperature ranges over 1000°F range are usually necessary. Dirt track, drag race, and street performance applications usually operate at temperatures between 500° and 1000°F. The best indicator for pad selection will always be on track performance – this is why we test our brake systems on the track. We also like the Winmax brake pads. Winmax offers a variety of pad options starting at high performance street use through tracking and racing. 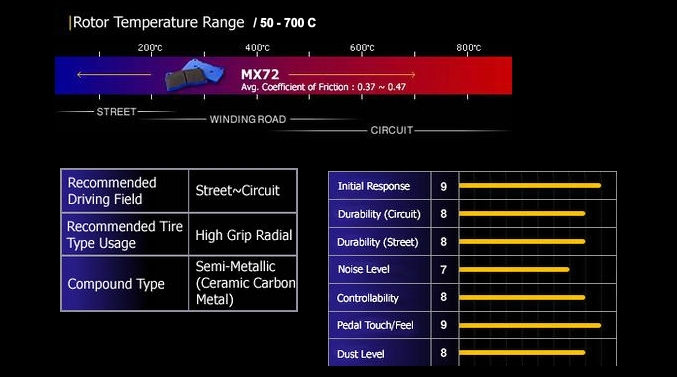 We like Winmax pads for their temperature and friction characteristics. We feel they fit well with certain OEM and RR Racing brake systems. For selected racing applications we offer our own designed and manufactured Titanium Pad Shims. In race applications, it is common to use titanium backing plates to reduce heat transfer between the brake pad to the caliper pistons. Titanium is superior to common steel backing plates due to its lower thermal conductivity. It acts as an insulator to prevent heat transfer to the caliper pistons and brake fluid. We exclusively use Goodridge USA stainless steel brake lines. High speed heavy braking puts great strains on competition hydraulic systems, where failure can be disastrous. Goodridge stainless steel hose strongly resists expansion under high pressure and temperature, provides consistent brake pedal pressure giving firmer and more efficient operation without that spongy feeling. 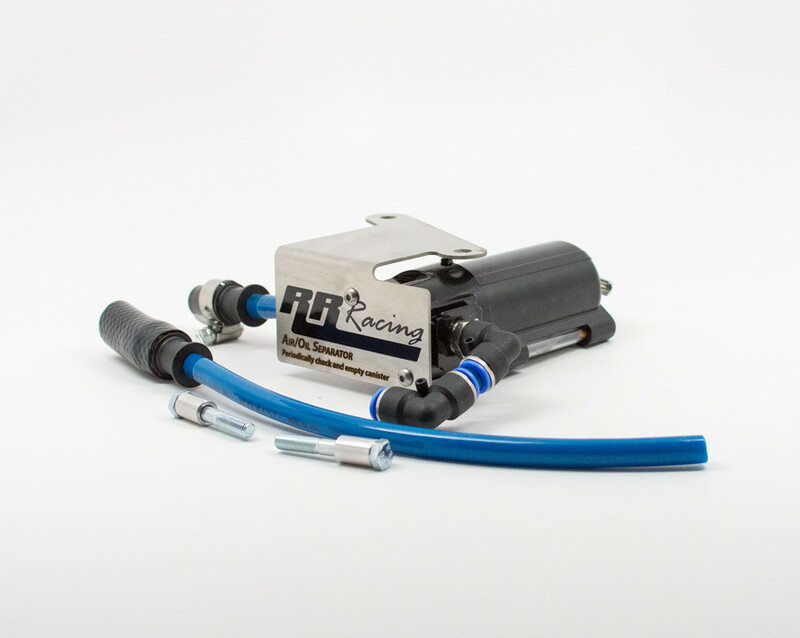 These brake line systems offer protection against abrasion and fire. Its microbore construction can give increased line pressure and more responsive and sensitive brake feel. 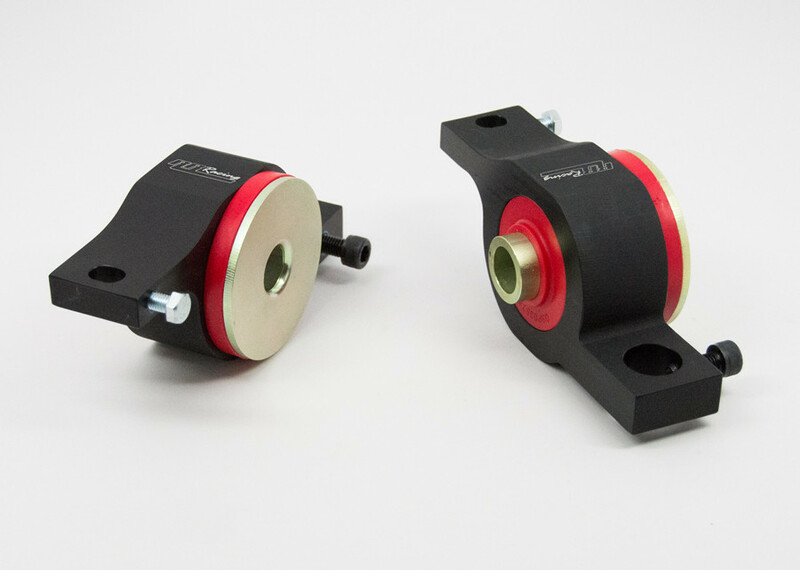 RR racing designs and manufactures caliper mounting brackets needed for each of our big brake kits. 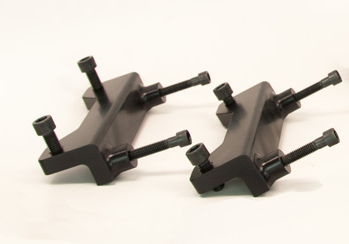 Mounting brackets are made of high strength aircraft aluminum for both durability and light weight. We machine our brackets using the latest CNC milling machines to high quality standards right here in United States. As with all our aluminum components, we black anodize our brackets to give them superior strength and corrosion resistance. For more information about our brake systems products, please visit our on-line catalog for your model. Selecting the right brake pad for your application can be a difficult task. Going with a street pad at the track or fast canyon road may ruin your day. Conversely, a dedicated race pad may overpower your tires and result in premature triggering of the ABS system, thereby reducing the overall performance of your braking system. 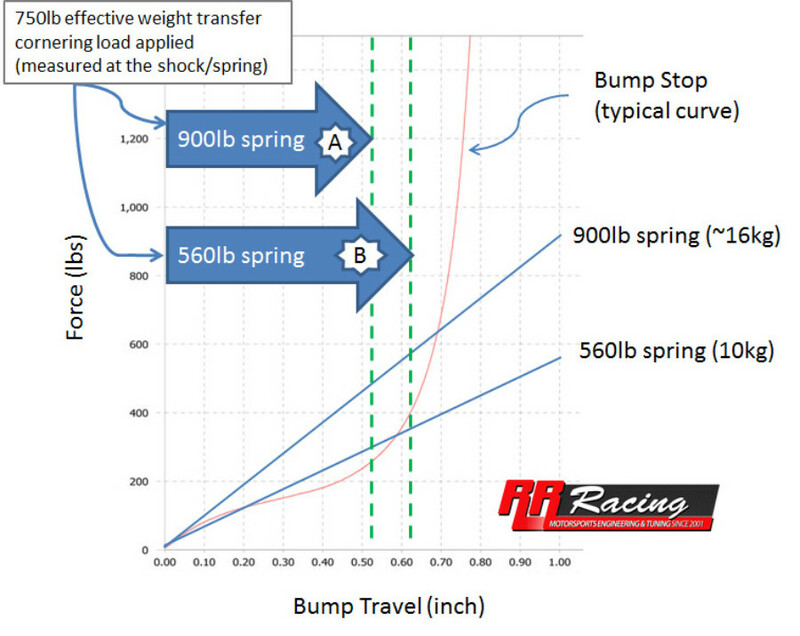 At RR-Racing, we have experimented with most of the compounds detailed in the charts below. We can order ANY pad compound available for your application, but based on our experience, we keep the following compounds in stock, as we have found they will meet 90% of our customer’s needs. If you have any questions please do not hesitate to call or email us. Wilwood BP10 0.40-0.45 Up to 800F Excellent pad for street performance applications, but not recommended for aggressive track day use. Available for our big brake kits. 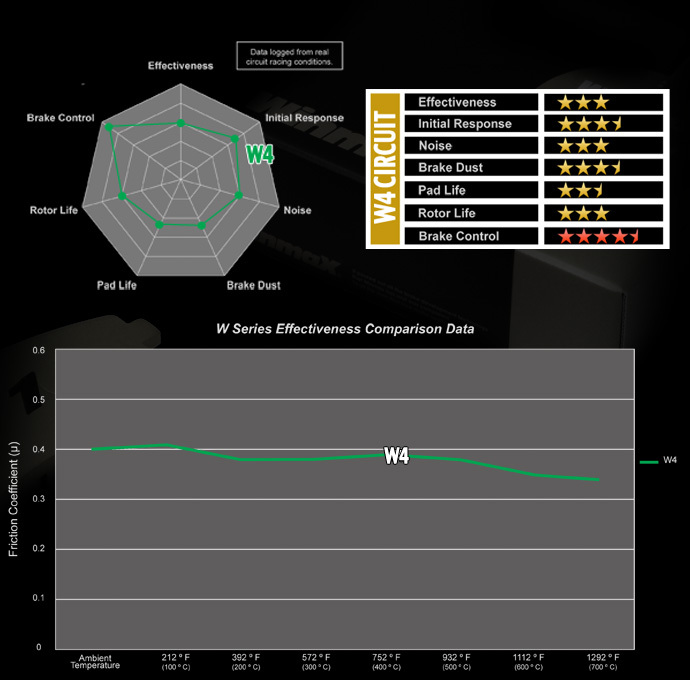 Wilwood BP20 0.40-0.53 Up to 1100F Our pad recommendation for someone looking for a dual purpose street & track pad. This pad is not noisy, normal dust levels, and performs well at HDPE track days. Available for our big brake kits. Wilwood BP30 0.60-0.63 Up to 1300F Due to the extremely high coefficient of friction, we recommend this pad for track day use only with semi-slick or full race slicks. This pad is easy on rotors, and works very well when cold, but we have found that it is simply too aggressive for street tires. Available for our big brake kits. Winmax W1 0.29-0.32 Up to 842F Non steel material pad, low dust, street use only. Winmax W2 0.32-0.35 Up to 932F Ceramic based pad, low dust, high performance street use, light track. Winmax W4 0.37-0.40 Up to 1200F Track pad that can be used on the street. Winmax W5 0.40-0.43 Up to 1382F Primarily a dedicated track pad, high metal pad not recommended for street use. Endless MX72 0.37-0.47 Up to 1292F Great pad for both street and track use. 0.40-0.53 Up to 750F Great overall street performance pad, low noise and dust. This pad is available for OEM applications only. 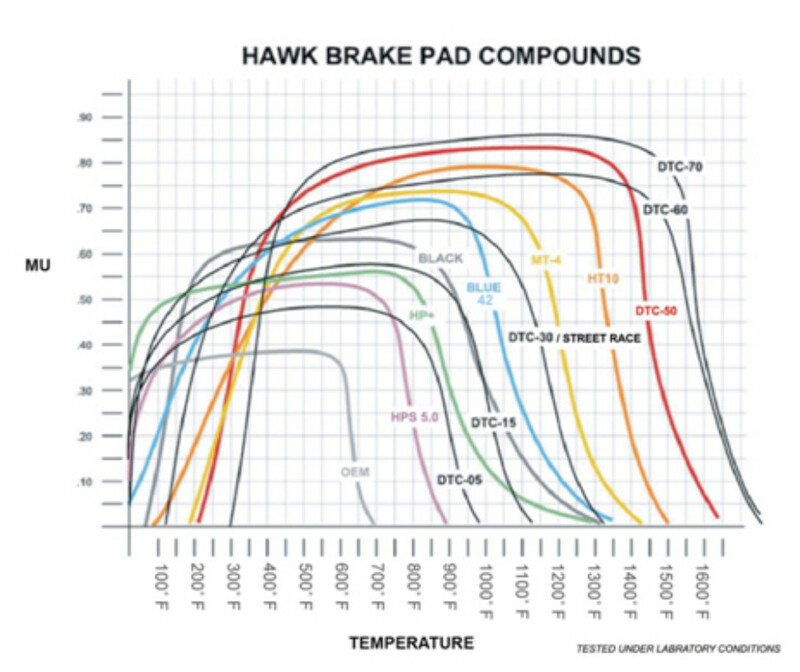 Hawk HP-Plus 0.50-0.56 Up to 900F HP-Plus is our recommended dual use pad for street performance, autocross, and track days. This pad has a very high friction coefficient that is very consistent across the temperature range. This pad is available for OEM applications and our big brake kits. Figure 1a: Wilwood street compound friction coefficient vs. temperature chart. Figure 1b: Wilwood race compound friction coefficient vs. temperature chart. Figure 6: Hawk Performance friction coefficient vs. temperature chart. When we originally drove this car we were impressed with the balance, handling, and intimate cabin, but were underwhelmed with the power. Although the Honda F20C engine absolutely screams to 9000rpm, the fact of the matter is that by today’s standards, the S2000 simply does not have enough muscle to wow us. Some purists say that S2000’s should remain normally aspirated. NONSENSE…. They obviously never drove an S2000 with forced induction! Our goal for this car was not to build a 500+whp dyno queen, rather we focused on building an “Ultimate Response” car with gobs of torque at low RPMs, instant spool, and sufficient high end punch. 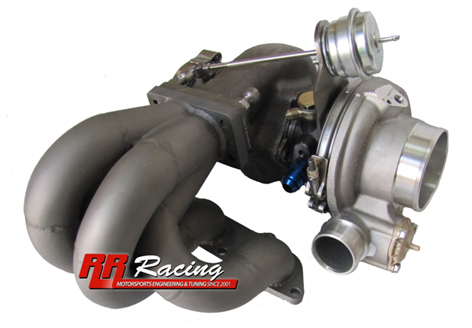 Rather than going with a Garrett GT3076 setup which is common among turbo S2000’s, we decided to try the new Borg Warner EFR7064. 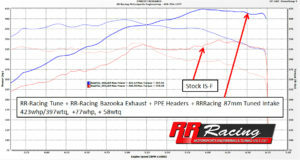 The EFR is a smaller turbo, and on paper does not have quite the flow capacity to match the S2000 engine at 9000rpm, but we were able to achieve 420hp at the wheels (on a Dynapak dyno) with a conservative pump gas tune utilizing Hondata Flashpro. Instant response and torque make this car a blast to drive. This setup makes significant torque from 3500rpm. That means that this engine has a useful power band of 3500-9000rpm, which is simply insane. 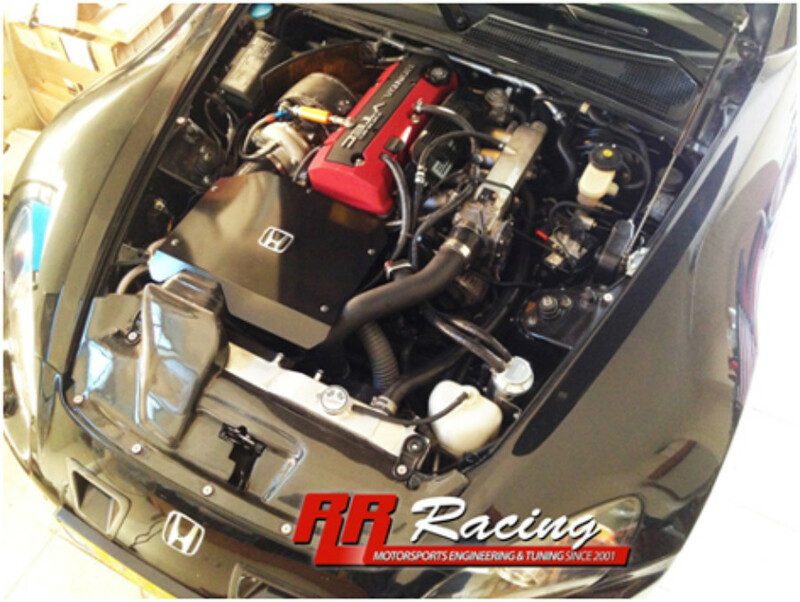 We like to joke that with this setup, you can easily outrun a stock S2000 without ever revving past 5000rpm! One of the keys to achieving fast spool is our turbo manifold, constructed from schedule 40 stainless piping. The short runners ensure fast spool and maximum heat retention. Another key aspect to achieving fast spool is the lightweight Titanium Aluminide turbine used in the EFR7064 turbo. So there you have it, the recipe for an exhilarating ride in an S2000 is a mid-size turbo, with fast spool characteristics and 420whp for top end punch. We completed the build by tidying up the engine bay and enclosing the air filter in a custom box in order to reduce air intake temperatures. Back in 2013, a good customer of ours came to us looking to build the ultimate canyon racer. The stock BRZ/FRS is a great platform, but in stock form it simply lacks power and grip. Starting in the power department, we decided to build our own custom turbo kit. 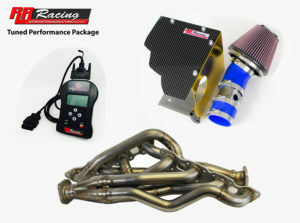 The basis of the kit would be the new Borg Warner EFR 6758 turbo which features ball bearings, billet compressor, and a lightweight Titanium Aluminide turbine wheel for immediate response and fast spool. Our goal was no more that 400hp, but the car had to have instant response with no turbo lag above 4000rpm. We set about fabricating the turbo manifold out of schedule 10 stainless steel. Once the manifold and downpipe were complete, we completed the intercooler installation. 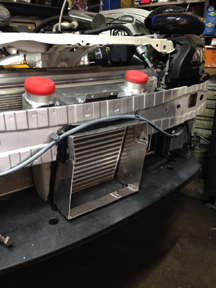 We chose a relatively small intercooler because we did not want to cut all the airflow to the radiator. The FA20 engine runs very hot, and closing off the airdam with a large intercooler significantly reduces the cooling efficiency of the radiator. Additionally, because we are running water/methanol injection, intercooler efficiency is less critical. One of the most important aspects of installing an intercooler or any other type of cooler is getting a sufficient pressure differential across the core. By ducting the intercooler, we are able to significantly improve the efficiency of a relatively small intercooler. By using a top mount inlet and outlet, we were able to significantly reduce the volume of piping and thereby improve the transient response of the turbo. 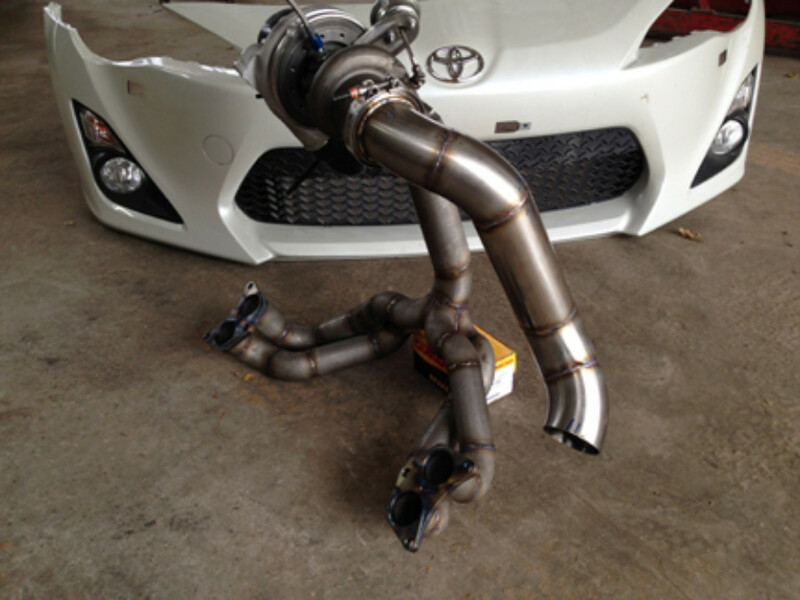 And there you have it… the completed turbo setup. 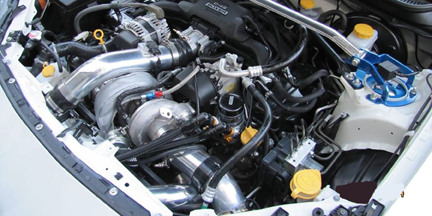 We were very impressed with this engine’s response to forced induction. The FA20 just wants to make tons of power, and with the new combustion chamber design combined with direct injection, is extremely resistant to detonation, especially compared to other Subaru engines such as the EJ20 and EJ25. That’s the good part about the FA20. The bad part is that the connecting rods are extremely weak (they are cast, not forged), and we highly recommend that anyone thinking of installing a turbo or SC on this car FIRST invest in an engine build. This is not something you want to put off, as a connecting rod failure will mean throwing the entire engine out, and will be much more costly than building it right the first time. For added reliability, we ran the Element Tuning Hydra EMS stand-alone engine management coupled with Aquamist water/methanol injection. Of course, we did not leave the rest of the car unattended. The addition of 17×9 Enkei RPF1’s wrapped with Hankook 255/35R17 RS3’s gave this GT86 enormous levels of grip. We would also like to thank Cusco Japan for their assistance and sponsorship of this car. Cusco provided their Zero A suspension package coupled with electronic remote adjusters, strut brace with integral brake master cylinder brace, catch can, steering bushings, transmission bushings, rear differential support and bushings, as well as front and rear roll bars. The capabilities of this car, when well modded, are truly remarkable! And last, but certainly not least we upgraded the brakes to provide endless fade free performance. Since this was not built to be a pure track car, we went with our “Stage II” 13″ solid rotor upgrade kit featuring 6 piston forged Wilwood race calipers and Goodridge USA stainless steel brake lines all around. Our Stage II kit is designed specifically to retain the proper brake bias, reduce unsprung weight, and provide massive stopping power. Welcome to our Lexus IS-F tech project. Here we will summarize our development of the IS-F, taking it from a great executive sports sedan, and transforming it into a Porsche and BMW fighting weekend track warrior. Sometimes we are asked why we chose the Lexus IS-F. Well, we love the car, it is an awesome chassis, rare, and has an amazing v8. We were also amazed at the lack of meaningful performance parts for this car, but we are changing that, so tune back here often to follow our progress! The photo at the top of this blog was updated in September 2015 and shows our new aero package for the IS-F. After increasing the track speeds, we felt that it needs a large wing in the back for better traction and handling. We chose an APR wing and adopted it for the IS-F. This wing produces about 800 pounds of force at 130 mph. The wing made a big difference in handling – just see some of the latest videos from our track sessions on our News page. A front splitter was also added. The splitter was strictly for the track made of composite plywood 😉 Don’t laugh this is what many race teams use. 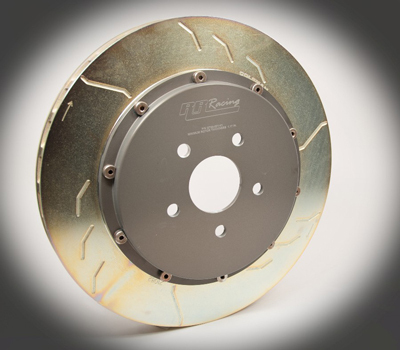 One of our initial goals was to improve braking performance by engineering a fully floating 2 piece front brake rotor. Working in conjunction with our rotor supplier, Coleman Racing, we utilized slightly thicker 360mm by 32mm rotors (OEM rotors are 30mm thick). 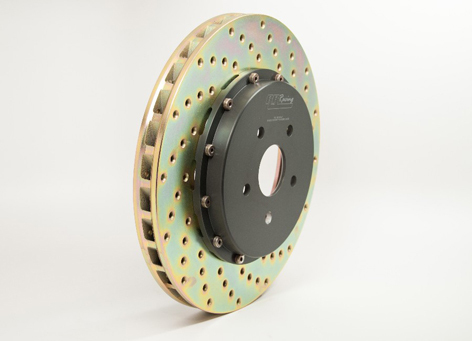 Compared to stock, these rotors have more thermal mass where it counts, at the brake friction surface. 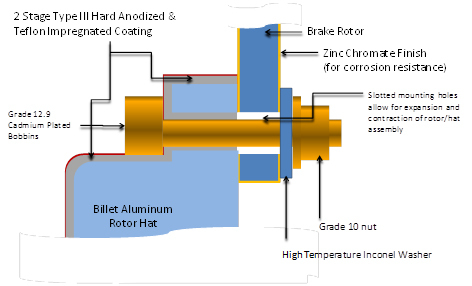 The rotors also feature directional cooling vanes and optional slotting or drilled configurations, dynamic balancing, stress relief heat treatment, and zinc chromate plating to inhibit corrosion. Most importantly, we utilized a fully floating 2 piece design that saves approximately 6lbs of rotating mass per rotor, and allows for thermal expansion and contraction of the rotor under extreme track conditions. So bottom line is, these rotors are tough, light, and will take all the abuse you can throw at them. http://www.topgear.com/uk/videos/9971522001 ). Apparently the Stig had been flogging the ISF at the Topgear test track and all the accumulated oil got sucked into the intake manifold while the car was idling on the line. 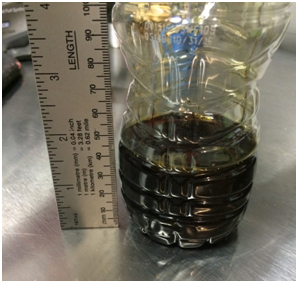 On our second track day with the IS-F, our Air/Oil Separator system was ready for testing, and we were very curious to see just how much oil the IS-F ingests in the course of just one track day (4-5 20 minute sessions). Let’s just say the results were shocking, its amazing just how much oil makes its way into the engine under high RPM and aggressive cornering. All that oil ends up burning on the intake valves or in the combustion chamber, which results in carbon buildup and even worse, detonation which causes the ECU to retard timing based on feedback from the IS-F’s 4 knock sensors. 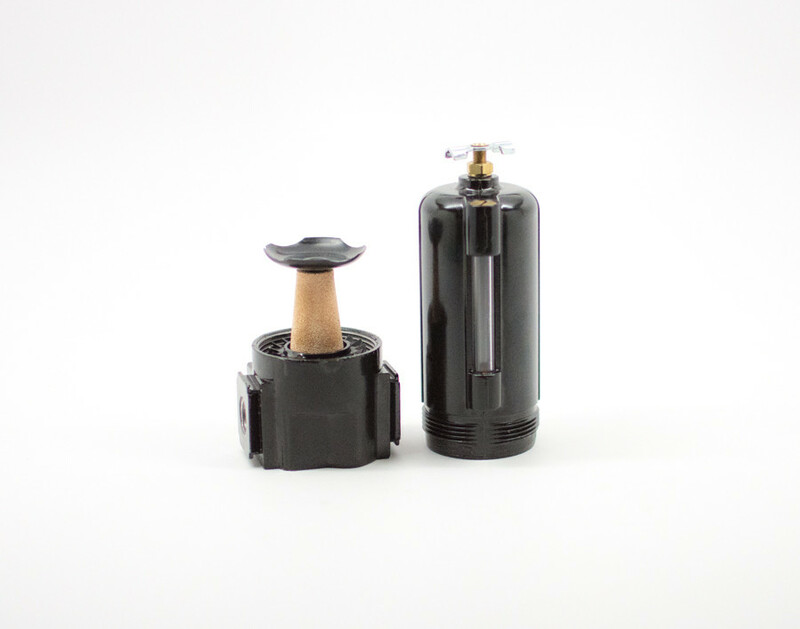 Update August, 2015: Since the release of the original AOS, we developed the second generation with a three times larger canister and a new bracket that fits both the IS-F and RC-F models. See photos below of our second generation AOS. All car manufacturers, to one extent or another, tune their cars to under steer at the limit. Problem is, if you are an experienced driver, under steer will slow you down. The IS-F tends to under steer more than some of its competitors, such as the BMW M3. The IS-F uses a “staggered” tire setup, with narrower 225mm tires in the front, and wider 255mm in the rear. By upgrading wheels/tires and changing to a “square” tire setup, we were able to virtually eliminate under steer, and achieve a totally neutral handling behavior. Our tire size recommendation is to stay with 275/30R19’s or less, or excessive fender rolling will be necessary. With 275/30R19’s , only minor adjustment of the fenders is required. The improvement in handling and balance simply transform the car at the track. In fact, we have found that most track prepared RWD street cars run non-staggered setup (with the exception of some mid and rear engine cars). Another important part we developed that helped tremendously with IS-F steering is the Ultimate Steering Response System (USRS). Since day one that we drove the IS-F we recognized why the car magazines that tested the IS-F when it came out stated that its handling and steering feel was just not as good as of the BMW M3 – the issue was with its lower control arm bushing. Toyota uses the same bushing across many Lexus models including the IS250/350, the GS and now the RC and RCF. This bushing was designed to isolate the driver from the road – not only does this bushing deflect laterally under load, but it also deflects fore/aft under braking, leading to imprecise and sometimes “wandering” steering feel caused by movement of the effective contact patch of the tire. 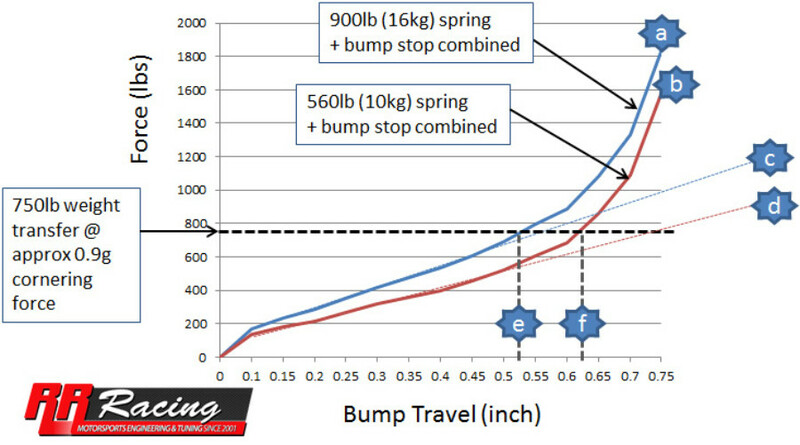 All current aftermarket offerings address the lateral deflection, but do little to eliminate the fore/aft deflection that leads to dynamic toe changes under braking and cornering. 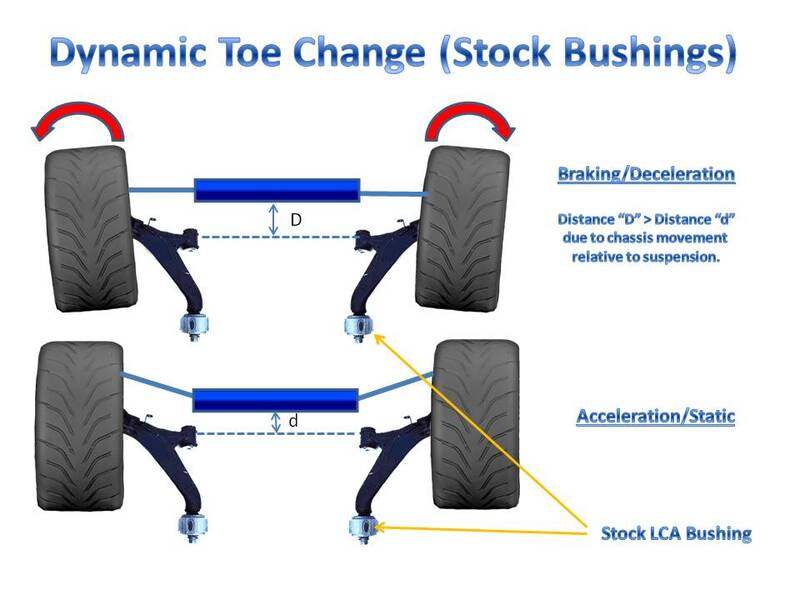 Please refer to charts below for diagrams of toe change and our lower control arm bushing design. 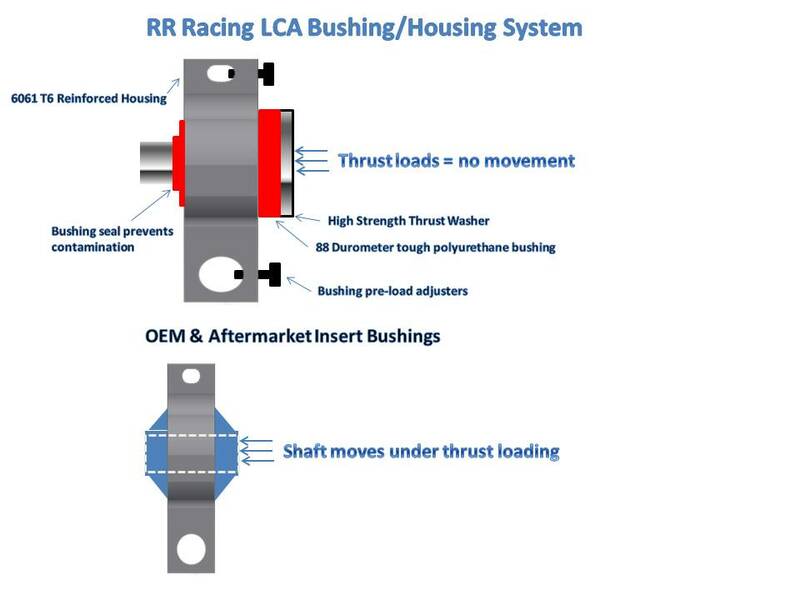 By eliminating excessive movement of the soft stock lower control arm bushing, we dramatically improved steering response and feel during hard cornering, without the excessive vibration and harshness associated with race-only hard spherical bearings. 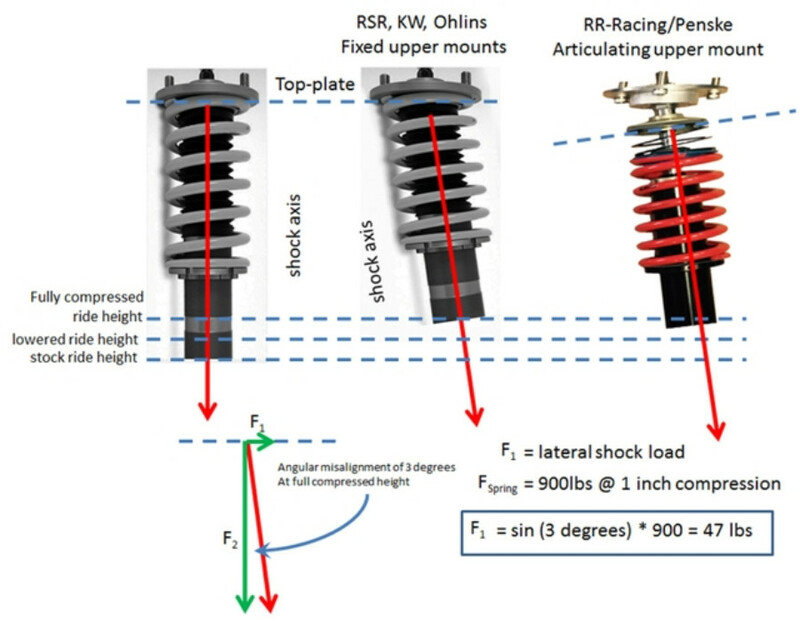 The design of our USRS went through three generations – we started with 80 durometer polyurethane bushing, then upgraded to 90A durometer, and now we are developing USRS Race version with a much larger inside shaft and smaller bushing giving the car even more precise steering control for track/race applications. 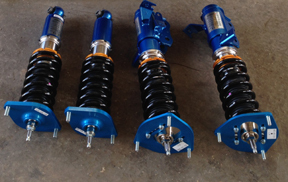 Yes, we know there are a number of coilover options for the IS-F, but we decided to make our own. Why? 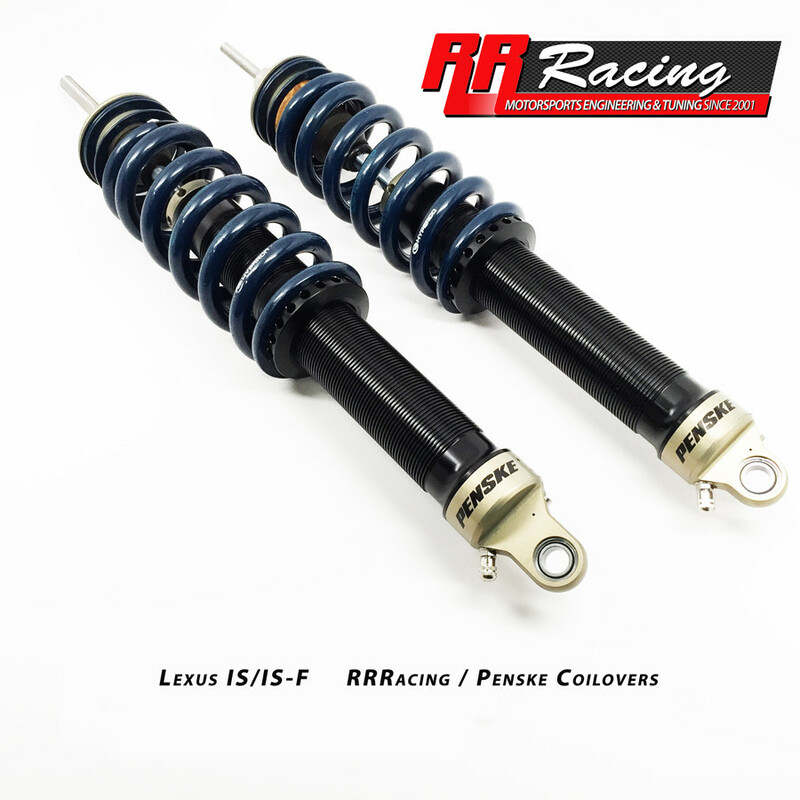 Well, we found that the current offerings did not offer the adjustability options we needed, and with the exception of the $5k Penske shocks, all the coilovers were made in China, Taiwan, Korea, or some other place other than the USA. 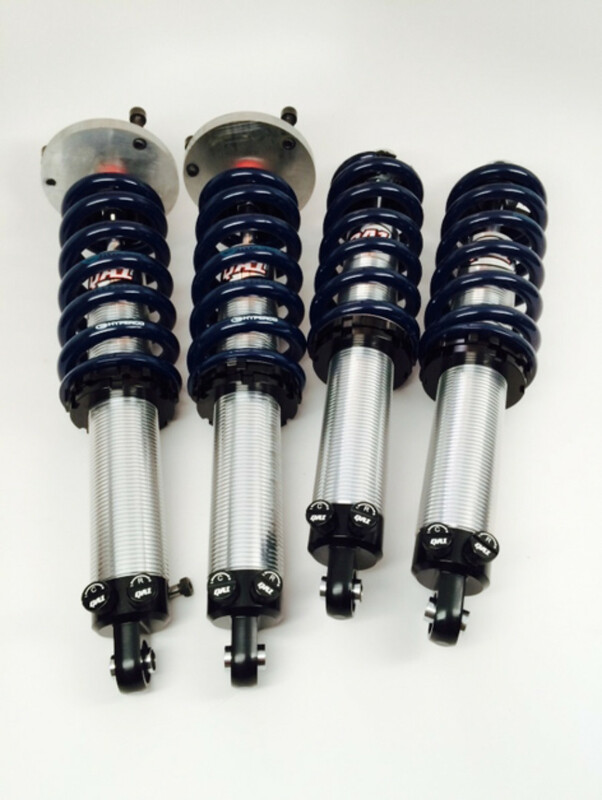 That said, we teamed up with QA1 and Hypercoil, two of the leading US based shock and spring manufacturers. For our initial testing, we chose the “Proma Star” double adjustable shock for its independent compression and rebound adjustability. These high quality American made shocks are also feature aluminum housings which save 20lbs compared to the stock suspension. Our initial spring choices (F/R) were 14kg/10kg, 16kg/12kg, and 16kg/14kg. For a “streetable” weekend track suspension, we ended up settling on 16/14 spring combination. 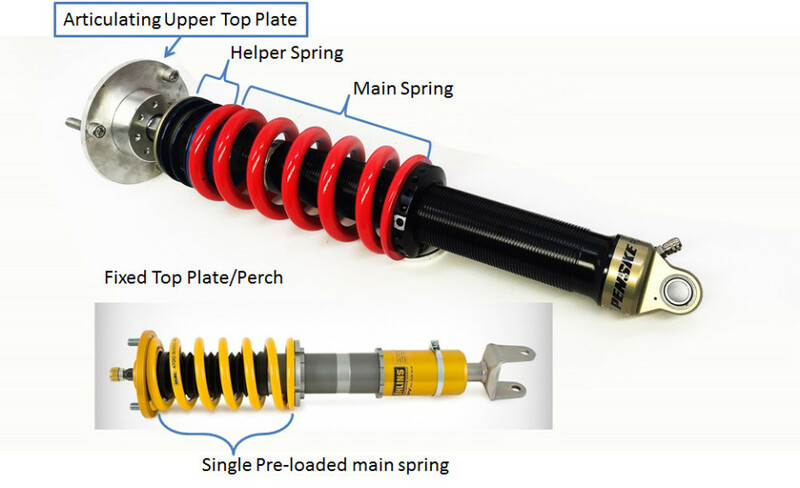 The higher rear spring rate compared to current offerings results in improved turn-in and transitional response. 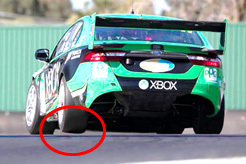 It does, however, tend to lead to slightly over steer bias handling, so we had to play a bit with the front sway bar. 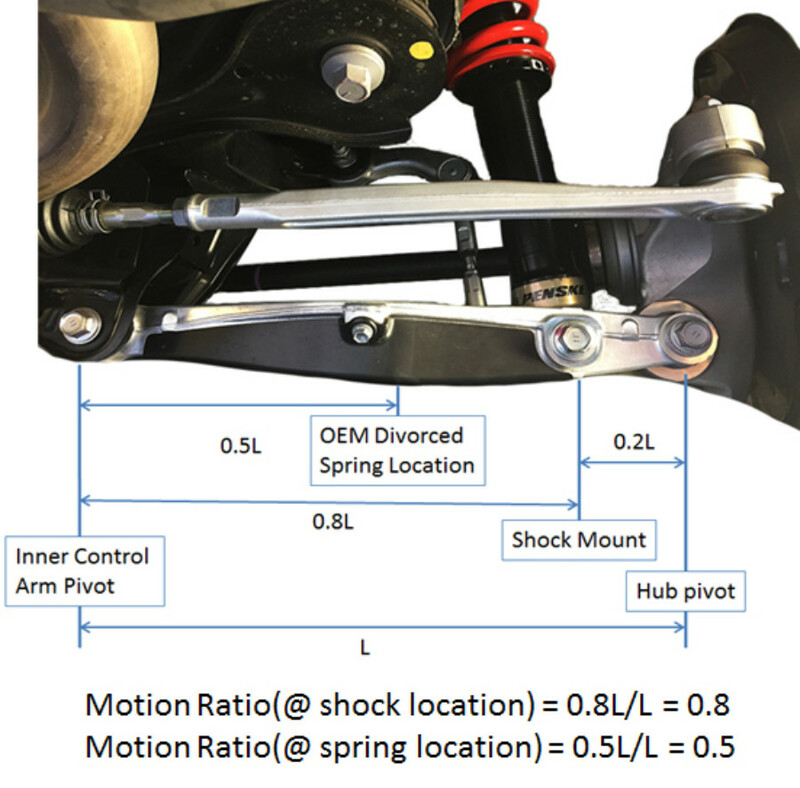 Read onto part IV where we modify the sway bar for free, improve transitional response, and restore neutral handling balance. 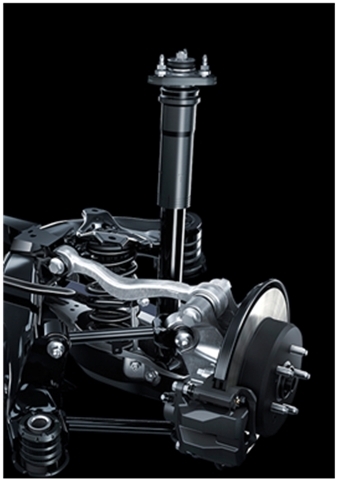 Update July 2015: We are still working with QA1 on developing an ultra affordable adjustable suspension for the IS-F. However, we ran into some noise issues that QA1 is working to solve. Meanwhile, we leveraged this experience to develop an ultimate suspension offering with Penske! As we noted above, we first shied away from Penske thinking that the $5k price tag offered by some of our competitors is too cost prohibited. But since Penske is practically in our back-yard, we decided to embark on this project. 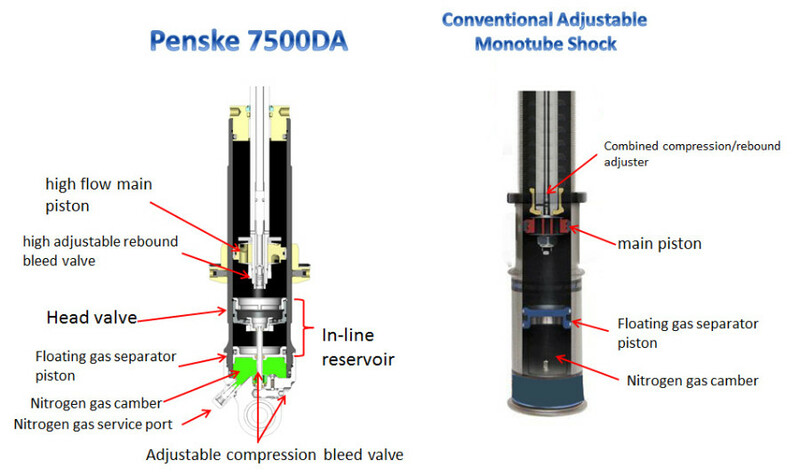 Within only few months we were able to develop a new Penske based suspension for the IS-F for a much lower price (see our on-line store). We were able to release RR Racing Penske suspension at this price by closely working with Penske engineers and by engineering and manufacturing mounting hardware on our own. We tested this suspension on demanding Pennsylvania roads as well as on the track, and the results were phenomenal. Penske truly lived up to its name! Modifying your car and taking your car to the track can get expensive, so we are always excited anytime we can make a meaningful improvement for free! 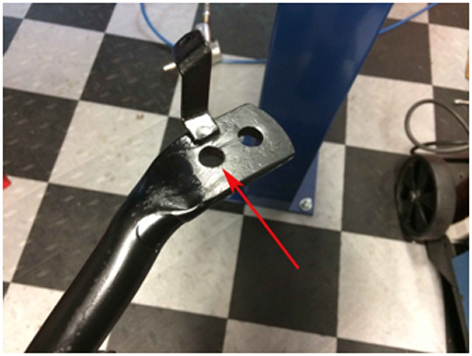 Luckily the front sway bar of the IS-F has a long and flat flange which allows us to drill a new mounting hole closer to pivot axis of the bar (see pic below). As you can see in the picture, we drilled a new hole 1” to the left of the original hole. We also had to do some minor grinding of the wheel height sensor tab, and you will also have to shave the sway bar endlink mount. With a handy 4.5” grinder, it takes a grand total of about 5 minutes to do. So by moving the mounting hole 1” closer to the pivot access, you stiffen the bar by about 15%, which isn’t too shabby for about 1 hour of work! 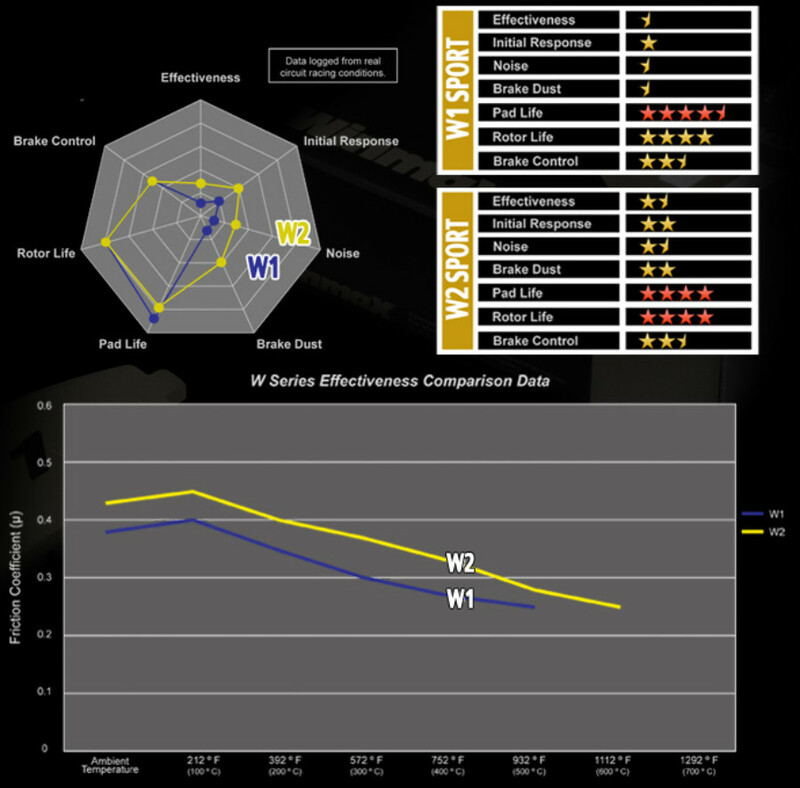 We highly recommend this mod for those looking to improve transitional response and reduce body roll, especially in conjunction with the 16/14 spring combo we recommend. 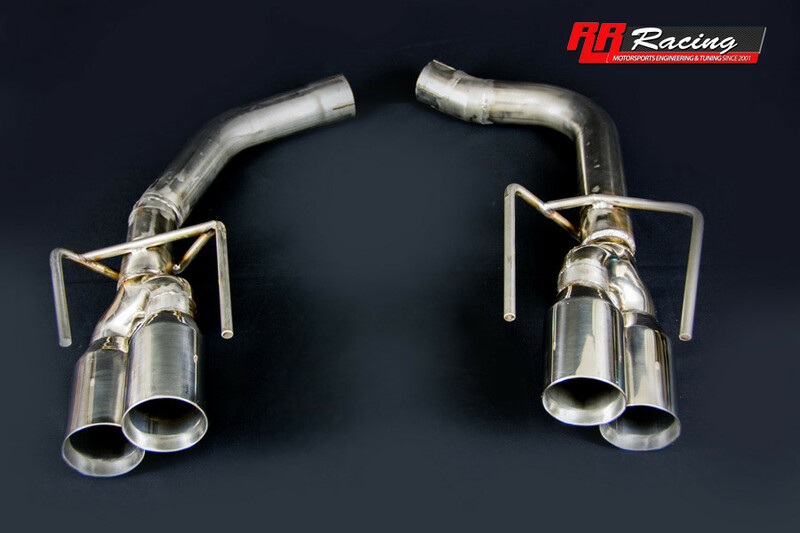 We started by simply gutting the catalytic converters from the exhaust manifold and adding a complete Borla exhaust system with Magnaflow high flow catalytic converters. 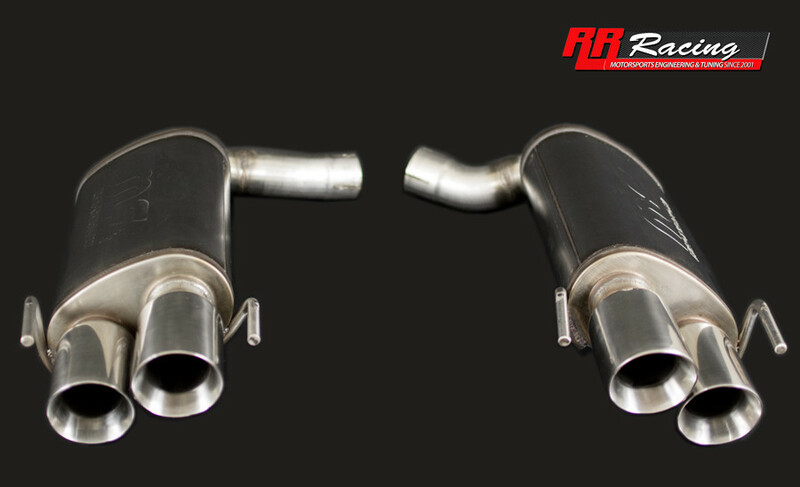 We estimate that this added about 30 hp to our IS-F (almost as much as a set of new headers would add). However, we were not happy with the look of the exhaust tips and the sound. So we developed two new upgrade options for Borla – Quad Tip with Magnaflow exhaust and Quad Tip Bazooka – both axle-back systems that could be bolted on to Borla’s piping. With the Bazooka our IS-F does not only run as a sports car on the track but also sounds as an exotic super car! You can listen for yourself on the video below. Power, Performance and more Power! We have been working on developing power enhancement for the ISF since 2014. 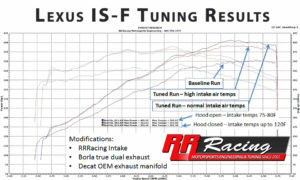 It has not been easy to tune the ISF ECU. Finally, towards the end of 2015 we finally had a break through! With our partner, we developed the capability to read/write to the ISF ECU. This was only the beginning, however. To decode and figure out the ECU maps and parameter handling was another effort. We had the best tuners and engineers working on this project — our chief engineer Rafi Raban for over 15 years of tuning and performance engineering experience and Steve Pearson, who is one of the best tuners in the country! The results finally came in the form of the first ever ECU upgrade tune for the ISF in January 2016 after over 2000 miles of road testing and road-dyno logging with many more hours spent on a sophisticated Dynojet dyno at a top-notch climate controlled facility. After extensive road dyno and datalogs, we headed over to top-notch climate controlled Dynojet testing facility and conducted many hours of dyno tests. But we were not ready to stop here. 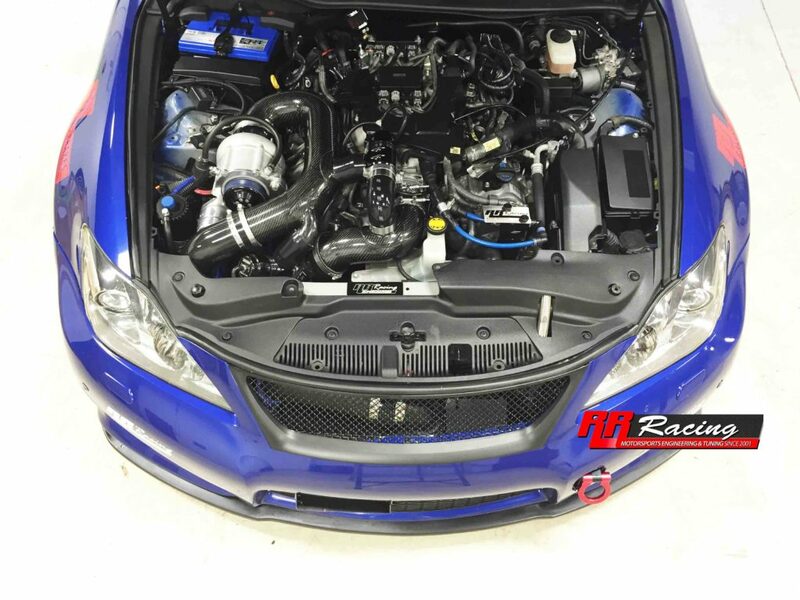 What is the ultimate horsepower gain for a normally aspirated ISF? Software tuning cannot deliver the best results without considering the full system and engineering hardware changes. We tested with larger MAF bodies, larger throttle bodies, various headers and exhaust systems, and tested various cold air intake designs. 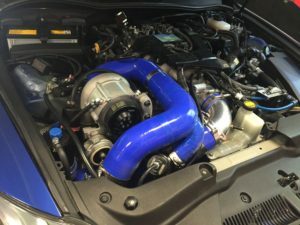 The result is a new Cold Air Intake System combined with our tune and PPE headers (which we found out to be the best headers in the country). 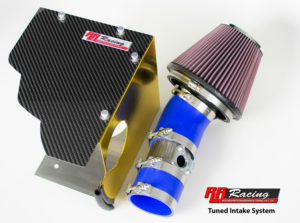 We called this RR Racing Tuned Intake System. And subsequently we packaged the first Performance Upgrade Package for Lexus ISF that can delivery between 60 to 80 whp — the most we think is possible for a normally aspirated ISF! So what is next? Of course, the first working supercharger! We have started testing the latest version of the supercharger two months ago. We decided to take it slow and limit the boosts of the first prototype to only 3.2 PSI. We wanted to optimize the mechanical components, the pulleys, brackets, belts, etc. After many miles of road testing, we finally took the supercharged ISF to the track on May 21, 2016 at the Pocono Raceway. Pocono Raceway is a very fitting track for supercharger testing combining both superfast straightaways with hairpin curves. Next we are adding more boost to find out the best balance between power and reliability. Stay tuned for more update on this exciting project! May 30, 2016 we Dyno tested the supercharger with a little higher boost of 4.0 PSI, we are getting very decent results of over 500 whp. We will continue to test the system at this boost level before increasing the boost. On October 31, 2016 we finally released the ISF supercharger kit for sale! We named it the RR625 model. This kit makes 528whp and 480wtq (Dynojet SAE) at approximately 7psi peak boost pressure, 93 pump gas, equipped with standard PPE headers and RR Racing Bazooka dual exhaust.